NILES, OH - The Mahoning Valley Scrappers are looking for families that are interested in being a part of a truly priceless experience; hosting a player. Host Families receive an opportunity that allows them to divugle into the daily grind and lifestyle of a professional athlete, gain a new member of the family and for many, create memories that extend past the summer. "It's become a part of the family, the front office, the workers, the players. Everyone is a part of the family," said current Host Family Matt Rarick. His wife. Ellen, added, "I never realized how much I could care about other peoples kids... It's a close knit family, the coaches, the team, everyone." Since the Scrappers inauguarl season in 1999, families in the Mahoning Valley have had the opportunity to host and provide a supportive atmosphere for Indians' prospects from mid-June through early September. In addition to life-long memories, Host Families receive complementary tickets, discounts on team merchandise, Host Family events and more. If you are interested in this opportunity and would like to receive more inforamtion on becoming a Host Family, you can contact Kate Walsh at (330) 505-0000 or email her at kwalsh@mvscrappers.com. The Scrappers Home Opener will be Sunday, June 16 at 6:35pm against the Batavia Muckdogs. 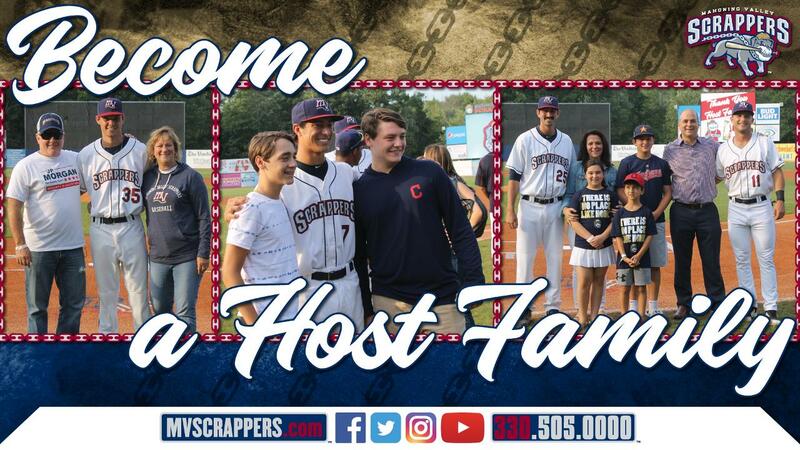 To stay up to date with the Scrappers this off-season or for more information on 2019 ticket packages, visit mvscrappers.com or contact the front office at (330) 505-0000.